Well I more or less managed the tractor! lots of only half seen machinery there that I have no understanding of whatsoever, so I hope it makes sense. Tommy is the farmer/owner of the cottages we stayed in. The tractor still looms! shall I tackle drawing that today or ... not? 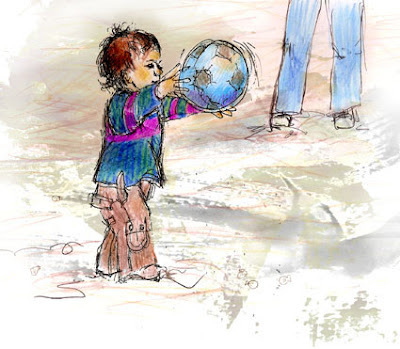 I've been reading a very good book on illustrating for children . It's full of good tips - some of which I'd done instinctively in the books I've done so far, some that I'll employ in the future. different scale and viewpoints - In a previous book I'd done things like looking down on a tiny Sam playing on the beach, from the height of the kite he is flying. Or as here, looking up a flight of steps at him jumping down. I'm working on the illustrations that feature Sam. 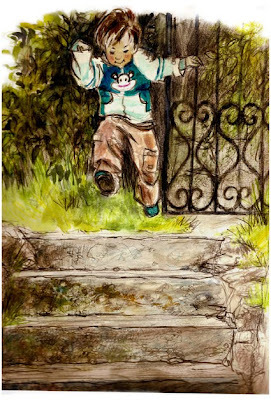 In this one I've re-used a sketch I did of Sam playing football in the summer. I scanned, cropped and printed it, coloured it, removed the grass, substitued sand and added the legs to suggest his father or grandfather. 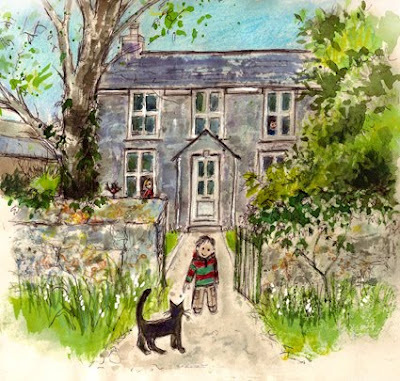 I've done a couple more illustrations for the book - this one is of Sam outside the cottage he and his parents were staying at (ours is 20 yards to the left) and Lucky the farm cat. His parents are peeping out of the windows. And this one is him collecting shells on the beach. Both are watercolour with touches of coloured pencils, oil pastel and pencil. 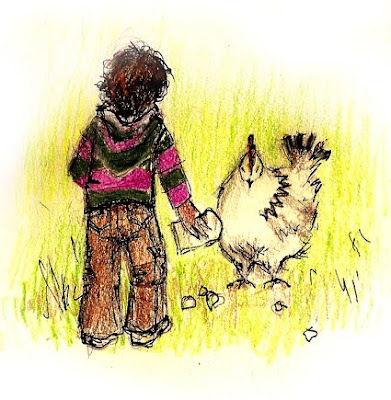 I've done the above sketch of Sam feeding the chickens for his book and the pencil drawing below, that needs colour adding (with watercolour/mixed media) of the house they were staying in - just a few yards away from 'ours' shown a couple of posts back. I've including Lucky the farm cat, his parents peeping out of the windows and a bird on the wall. Tomorrow I might get the colour added. I need to keep a balance between the cartoon figures and the style of sketching. 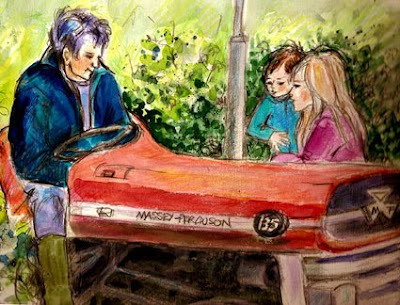 I think I'm going to make a book for my grandson for his birthday about his holiday with us there. I'm using the painting of the farm as the cover and I'll include the painting he did. I think I need to move it up slightly on the page before printing. Unfortunately I can't take images right to the edges - unless I print A3 - or design the book a little smaller and cut it down when printed. I don't think I like the vertical type with the image when seen folded either ..... all is subject to change at this very very early stage. The font is based on my handwriting. 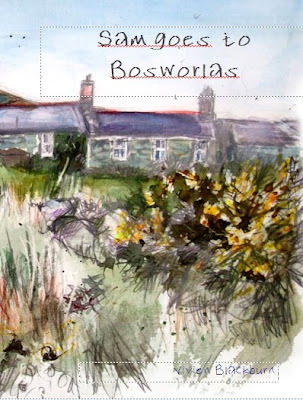 I've been looking at the photographs from last week, to assess their potential for painting from - I simply didn't have enough sketching time being away with extended family but I'd like to get some paintings done. 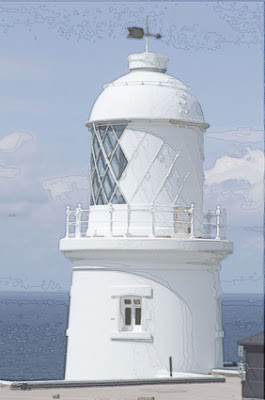 The simplicity of the image lent itself to posterisation/find edges techniques, with some erasing and tweaking and use of layers to combine the edges/posterised colour. This photograph, below, is ok - but I really like it above - simplified and made cool and airy (though it was a vividly blue day). I think it has potential for development - printmaking maybe? I need to work in pastels today to get some work ready for an exhibition so maybe not this image.. 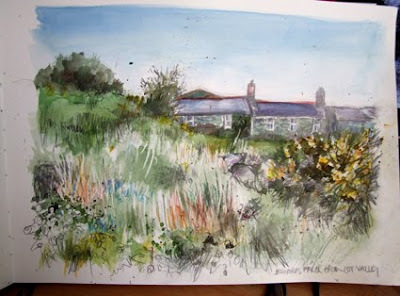 I didn't have chance to sketch the farmhouse from the valley below while we were there. so this one is done from a photo shown here, along with the photo below of the stream running through it. It's about 12 x9 inches. 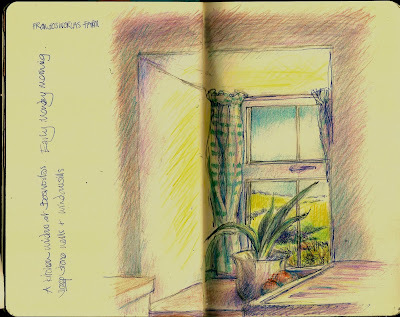 Sketch of the farmhouse kitchen window - the walls are about 30 inches deep - coloured pencil, mainly polychromos and Lyra, in moleskine sketchbook - 'large' size. I did this sketch of the window in the kitchen at the farmhouse early one morning. The stone walls are very very thick so the windowsill is about 30 inches deep. The warm light, shown by the yellow, is a little more subtle in the original - the scanner exagarates it. 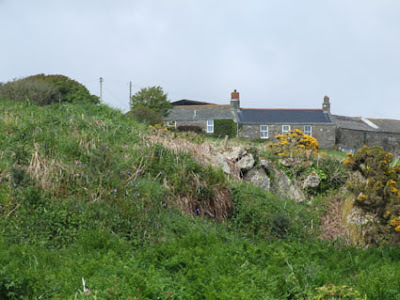 Much as I loved the farm, I realised how much I missed waking up to the sea view of other properties we've stayed in - links below. Sorry for the long absence - a mix of not being well, work being absolutely hectic and then being on holiday. 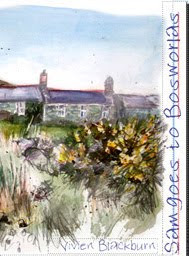 This is where I've been - a lovely farmhouse up on the moor, just above the coast in the far south west of England - only a few minutes from Lands End. the stream that tumbles down through the valleyby the house, comes out at Porth Nanven below, less than a mile away.